Ceramic Kitchen Knives offer a new and exciting way to prepare food safely and more healthily. These Black and Red Ceramic Knives offer a perfectly balanced sharp and stylish knife design. With each knife set, we have thought purely on your home or workplace environment to bring together the perfect Kitchen Knife to prepare food with. Professional Chefs recommend Ceramic Knives as the ideal kitchen utensil when it comes to food preparation. These kitchen knives have a stylish black and white chequered blade with a Black or Red coated soft grip handle for comfort. Our knives would make the perfect gift for a friend or loved one, as these Ceramic Knives will soon become the talking point in the kitchen and, unlike Steel Knives, they will remain sharp without the need for a knife sharpener for many more years. They’re also dishwasher proof and easy to wipe clean. 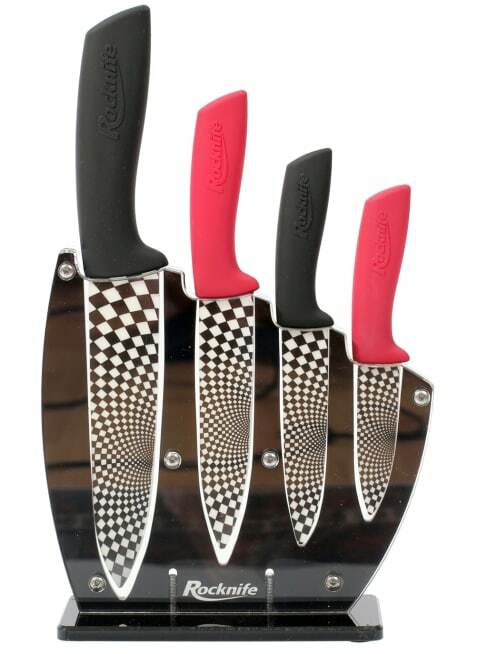 This set of Red and Black Ceramic Kitchen Knives offer style and smarten up your kitchen or workplace. With each set comes a Free stand to give you the freedom of choice when it comes to storing your knives, either free standing on the kitchen worktop or have them wall mounted (screws are included) to give you easy reach. Please note that the orientation of the stand screws may differ from as shown on website photographs.